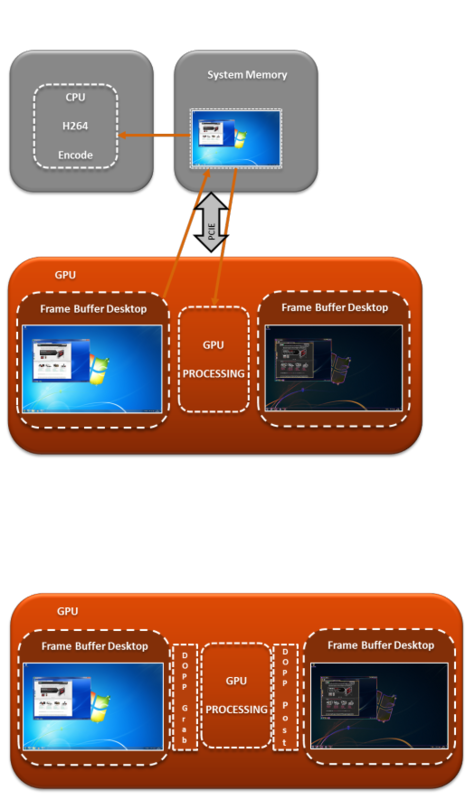 Applications often need to capture the entire OS desktop directly from GPU memory in order to apply some transformation in real time with minimal latency. AMD has created an OpenGL extension, Display Output Post Processing, that provides direct access to the desktop image in GPU memory. This means you can transform the image and replace it easily and efficiently. DOPP is an AMD OpenGL extension that lets users of AMD FirePro workstation cards grab the desktop directly as a texture. You can then manipulate it in an almost infinite number of ways before it is output to a display system. Arbitrary Warps Using DOPP shows a desktop before and after DOPP warping. Grab the desktop as a texture. Use the full OpenGL API to transform the surface. Send the transformed (present) surface to video out (including wirelessly). DOPP works for the AMD FirePro™ W600, W5x00 and above, and for all AMD FirePro™ S series products. You enable DOPP on your system using DOPPenable.exe. DOPP is currently supported on Windows® 7 and Windows® 8. This tool enables DOPP on your system. You need to to that if you want to use the DOPP feature. Before using DOPP, please start this tool and click on “Enable DOPP”. Then restart your system. Open source sample that shows you how you can apply several visual effects on your desktop with DOPP.